until Rudy flings himself onto the ground. 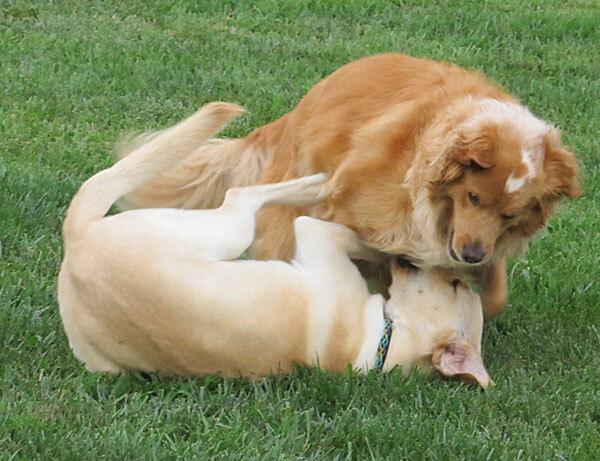 And my rowdy retriever boys work towards a good game of bitey face. so cute! Send them here, Dakota could use some roughing up! That is quite the retriever dance! LOL! Hm, I think that the US team could use a couple of great wrestling athletes like them at the 2016 Olympics! :-D Keep training guys! Great pictures! I love seeing dogs having a fun round of bitey face! At least they are having fun... we hope! Always nice to have a friend to play/dance/bite with! Bitey face! My babies step on each other's feet. And my feet.